1971 �La Mortadella� (aka �Lady Liberty�) as Policeman, uncredited. 1980 �The Private History of a Campaign That Failed� (TV) as "The Stranger". On Broadway, Herrmann won a Tony Award for "Mrs. Warren's Profession" and was nominated for "The Philadelphia Story." He's also starred in "Life Sentences" at New York's Second Stage Theatre, "The Three Sisters" at the McCarter Theatre, "Love Letters" at Chicago's Steppenwolf Theatre, and in London, "A Walk in the Woods" and "Tom and Viv." 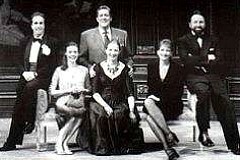 Herrmann also starred in the original production of Neil Simon's "The Dinner Party" at the Mark Taper Forum in Los Angeles (photo left).